Say the words “Jet Set Radio” to a fan and, once they stop smiling, they’ll tell you all about the game’s “vibe”, its music, its eccentric cast, the way it let them dabble in a little virtual tourism of the Japanese capital. On acid. Which is funny, because the game isn’t actually about any of those things. It’s about graffiti. The entire point of Jet Set Radio is that you’re in a street gang. The requirement of the game is that you have to plaster every empty wall around you with a tag or, if the wall’s big enough, an elaborate piece. So that’s what you do. It’s almost all you do in the game. You skate around, avoiding the cops and rival gangs, and every time you have half a second to spare, you pull out an aerosol can and you go to work. The way you actually handle this could have been better, of course. It’s less about creating art as it is copying some thumbstick rotations that flash up on the screen. But then, any complaints about a lack of creativity in your graffiti’s creation can be addressed by their design, in that the game included a surprisingly complex and detailed suite that let you design (and even upload) your own pieces. 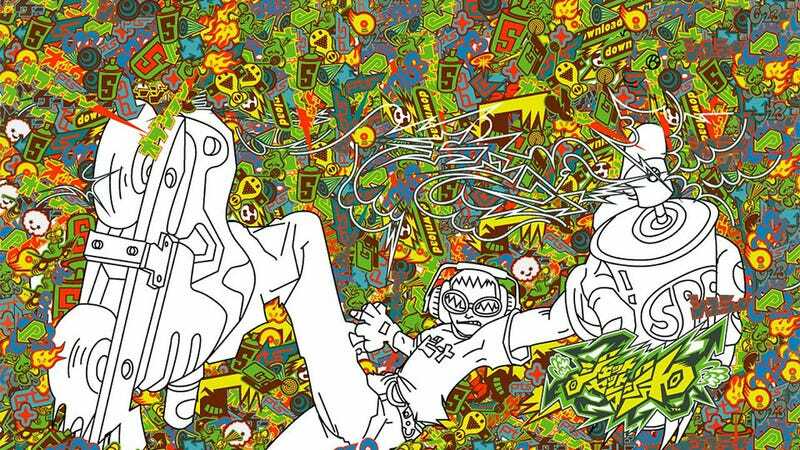 It’s an under-appreciated reason why Jet Set Radio carved itself such a loyal and dedicated fanbase. Because really, how many other games make the art of graffiti a core concept? There has been the side-scroller Sideway: New York. And the awful Marc Ecko’s Getting Up. And...that’s about it. Jet Set, on the other hand, didn’t just include it, it did it justice. As a little celebration of that, then, throughout this post you’ll see some of the game’s original, default graffiti selections.